"Gripping as it is, Johnston's masterful novel is worth lingering over--it soars above the constraints of a traditional thriller and pulls you deep into the secrets of a grief-stricken town." "Johnston dazzled with his breakout thriller, Descent; his follow-up is a more ambitious page-turner, unpacking how a shocking murder impacts the denizens of a small Minnesota town as they weather suspicion, guilt, and grief." "Tim Johnston's second novel, The Current, is even better than his first, which is saying something. He's a terrific writer and definitely a name to watch." "Johnston writes in gracefully exact language with genuine heart . . . reminiscent of writers like Annie Proulx and Richard Bausch." "Tim Johnston's gripping second novel is much more than a skillfully constructed, beautifully written whodunit. It's a subtle and lyrical acclamation of the heart and spirit of small-town America. The Current is not your conventional, frenetically paced page-turner, although it smolders with a brooding, slow-burn tension that nudges the reader forward, catching you up in the lives of the troubled solitaries at the book's core." "Pick up Tim Johnston's suspenseful novel The Current and you risk finding yourself glued to your chair, eyes to the pages, no thought of attending to daily obligations. Johnston's elegant, cinematic style takes us into the characters' lives and history, problems and concerns. The book examines that horrifying moment when everything changes, the before and after when love, friendship, hopes and trust turn into dread, guilt, blame and grief." 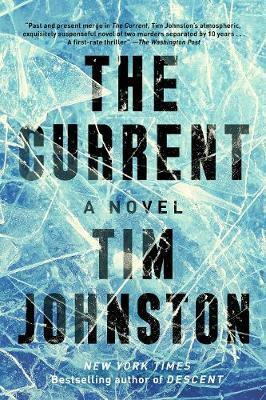 "Tim Johnston's new novel, The Current, is an exceptional tale of suspicion and secrets--and a strong follow-up to his excellent 2015 book, Descent." "The author of Descent, returns with a tour de force about the indelible impact of a crime on the lives of innocent people." "[An involving and layered thriller . . . Johnston's prose is so lyrical you want to stop and read it again." "With The Current, Johnston presents readers with another slate of unforgettable characters." "Along with his poetic style, the author's acknowledgement of the complicated nuances inherent in friendship, family and love, especially the love of a parent for a child, elevate this tale to literary fiction." "With unhurried ease The Current carries us along, mirroring that fatal river, as clear as winter ice on the surface while beneath flowing darkly into the past." "This novel is careful layer upon careful layer, as deceptively thick yet brutally delicate as winter ice itself. Johnston's descriptions of people, places, grief, and loneliness are subtle and evocative; the minor plot about an aging dog becomes a rending portrait of the ravages of love. Indeed, for all its harsh observations about human nature, this novel has at its heart a strong belief that love, for all the pain it brings, is the one thing that truly saves us. An apt title that functions as a beautiful metaphor for all the secrets and emotions roiling beneath the surface of every human life." "[An] outstanding thriller . . . Johnston imbues each character with believable motives. The nuanced plot delves deep into how a community--and surviving relatives--deal with the aftermath of a death." "Tim Johnston's Descent, a complex missing-person thriller set in the shadowy wilderness of the Rocky Mountains, was one of 2015's most pleasant surprises. His follow-up, The Current, is equally, if not more, impressive . . . as methodical as Johnston is at unwrapping his carefully plotted story, readers will churn throughThe Current's 400 pages--a paradox that only the most accomplished mystery writers ever achieve. The only complaint is that we might have to wait another three years for his next one." "The Current is a rare creature: a gripping thriller and page turner but also a masterwork of mood and language. You'll want to go fast at the same time you'll be compelled to savor each and every word." "I would have taken a break long before 2:00 a.m. last night were it not for Johnston's masterly ability to rummage inside the heads of his various characters, revealing the frayed fabric of small-town life in the process and showing us the stand-up grit of a handful of women and men . . . We need a little hyperbole if we're going to adequately describe how much we love a Tim Johnston novel." "Johnson plots out intricate story lines--his character development is thorough and intensive . . . what an invigorating read!" "The Current is moody, layered crime fiction at its finest; you'll be tempted to tear through the pages, but, slow down. The lyrical language is worth lingering over." "Tim Johnston has given us the gold standard of lush narrative description--captivating, mesmerizing, stunning. It's doubtful you'll ever read a more beautifully written book than The Current." "The Current is a haunting story . . . Johnston masterfully describes people, their grief, their guilt, and loneliness. He brings out both the brutal and loving sides of human nature. It is a real treat for those who love thrillers."